Heavy duty grids versus ordinary car batteries provide enhanced durability under today’s harsh operating conditions. Built to Handle Extremes. Blistering heat and bitter cold are ruthless battery killers. 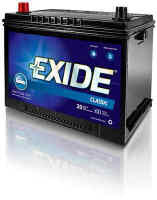 That's why Exide pioneered climatized battery design nearly ten years ago—to offer you long-life, high-performance starting power that will get you going even under extreme conditions. Our "all-climate" Champion and Exide batteries stand up to the harshest temperatures, and come in sizes and configurations to fit almost any vehicle. · Maintenance free and safe to handle. · Heavy duty, robust internal components improve connections, lower resistance, and extend battery life. · Improved grid and plate designs maximize performance while resisting corrosion and vibration. · Available in conventional or dual-terminal, universal fit configurations. · Designed to replace original equipment batteries and meet manufacturers specifications.